Kayaking Crazy Creek, Futaleufu, Chile. Here’s a photo of a friend of mine, Matthias Melcher, whom everyody calls, for some reason, “Matze”. This was taken in the first few weeks of my time in Fuateufu, Chile. It had been raining incessantly for some time, and this little creek called “Crazy Creek” was running high. Matze wanted to paddle it (I think because it had the word ‘crazy’ in the name), though he’d never run it before, and never scouted it either. In fact, I believe maybe only one or 2 people had kayaked it previously (Matze’s a little bit crazy). So a few of us decided to hike with him up the mountain to where he was going to put on the creek, at its headwaters at Lago Nor Esté. So we set off, from town, on foot. Well, it turns out this hike is several miles. Several long, hard steep miles. 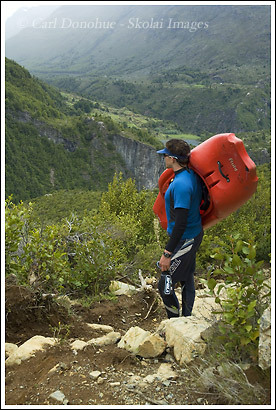 Without carrying any gear it was a solid hike – Matze carried this kayak the whole way (I told ya, he’s crazy). Because none of us knew the way, we ended up hiking quite a bit further than we needed to, and Matze had to put on in a mile or so up the lake, meaning he had to paddle a mile of flatwater, into the wind, after carrying his kayak for maybe 5 miles, before he even got to the run down the creek. The rest of (the ones not quite so crazy) hiked back the way we’d came. Matze, of course, was already back home, and had eaten dinner by the time we got there. This photo was taken on the mountainside above Crazy Creek, a small creek that runs into the Espolon River, a tributary of the Futaleufu River, near Futaleufu, Region X (Region 10), Patagonia, Chile. More whitewater kayaking photos. Matze’s currently in BC, Canada, about to start working his 4th season up there. Have a great season, my friend. This entry was posted in Adventures, Backpacking and Hiking, Chile, Kayaking, People on April 25, 2007 by Carl D.